Scarecrows joined the champion livestock on parade at Dunster Show on the hills of Exmoor yesterday. 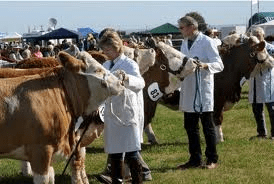 The popular event in the Exmoor farming calendar is held against the dramatic backdrop of Dunster Castle and attracts thousands of holidaymakers as well as locals. This year West Country Young Farmers Clubs were tasked to produce a scarecrow that looked like their chairman. Emma Williams, chair of Winsford YFC, was one of many who came face to face with their double. Graham Bigwood of Williton, who has been tending Herefords since the age of eight, took the Hereford cattle championship with Westwood Fearless, which also won the Hereford senior bull class. The beast also took the breed championship at the mid-Devon show and a first at North Somerset Show. Mr Bigwood has been farming for 40 years but now keeps just 10 cattle. Sophie Tyne, from Colleton, took the Arab Horse Championship with Eternal Spirit, a 15-year-old grey gelding. The show is also a showcase for the next generation of farmers. Among the entrants in the young handlers’ classes were pupils from West Somerset Community College, showing their Exmoor Mule sheep.